Away Weekend 2014 - Breaking News! There were some crazy outfits on the golf course today! Kathy Dale and Rogie Taylor pitched up in matching onesies. Not to be out done, Sue Watson was disguised as a reindeer and Lyn Gooday had turned herself into a walking Christmas tree! However, the 'crazy Christmas clothes' competition was won by Christine Skeen and Diane Chapman. It was a tough job to choose winners but Chris and Di clinched this victory with their ridiculous headgear and cheeky slogan 'Nice Baubles' emblazoned across their chest! Quite surprisingly, full fancy dress did not seem to hinder the quality of the Ladies' golf. They produced some good scores for this 9-holes Greensomes competition. Jo Wilkinson and Helen Leigh took 2nd place with 20 points and were just pipped to first place by Jodie Lusby and Maria Burton with 21 points. This was our last competition in the 2013 calendar, which made it an ideal opportunity to hand over our cheque to Lucia Martinez from CLIC Sargent. Lucia gave a short presentation on how our donation might be used to support Hertfordshire children with cancer and their families. It was my great pleasure to present Lucia with a cheque for an amazing £5,815. Thanks to everyone who has contributed over the year in so many ways. It is greatly appreciated. 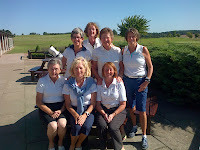 As this was my last event as Ladies Captain and my last blog of the year, I would really like to take the opportunity to thank all of the Chesfield Downs Ladies for the support, generosity and sense of fun they have shown throughout the year. All my very best wishes to Megan and Brigid for next year. I know they will have a great 2014, as Chesfield Downs is blessed with an amazing Ladies Section. It was great to welcome 93 ladies today to play in our Winter Invitation, 38 of whom were guests invited by Chesfield Ladies. 5 local clubs: Barkway, Heydon Grange, Letchworth, Mill Green and Mt Pleasant entered teams of 4. Playing 9 holes only on the front and the back meant that there were 2 competitions on the go at the same time, producing plenty of winners for the day. Overall, in 3rd place was Kathy Dale on the front with 18 points (c/b) and Amanda Macknight on the back with 18 points (c/b). In 2nd place was Jill Bransby on the front with 18 points (c/b) and Mandy Unger on the back with 18 points (c/b). In 1st place was Alison Webber on the front with 19 points and Diane Chapman on the back with 20 points. Congratulations to all of the winners and many thanks to the rest of the ladies for taking part. Thanks too to our volunteers for ensuring that the day went smoothly: Tom Wood & Joan Meek for registration, Liz Cooke for selling raffle tickets and Gerry Clark and Brian Feaver, our starters and photographers. We held our last raffle of the year in aid of CLIC Sargent and raised £391 - Fantastic! Our last big occasion of this year will take place on Thursday 12th Dec, when we will play our Xmas Greensomes and celebrate the festive season with mulled wine and mince pies. 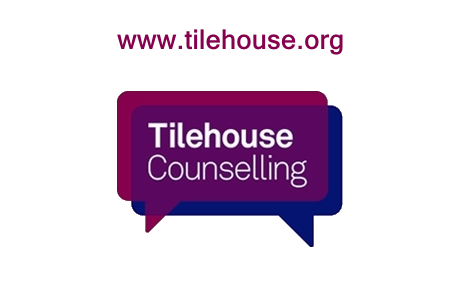 We will present Lucia Martinez from CLIC Sargent with a cheque for all we have raised this year. Lucia is going to update us on how our money might be spent to help families of children with cancer. Congratulation to the four winners of this year's Stableford League competition. First place in Division 1 was hotly contested, with Kathy Just beating Chris Leary into 2nd place in the final round of the competition. Well done to all the winners and thanks to all the ladies who took part. Well that's it for this year Ladies! We have played our last qualifier for this season. Well done to all the players who took part in the Scratch & Handicap Cup, particularly the 16 ladies who achieved the lowest gross scores and who will go on to compete in our 2 knockout competitions over the Winter. The 8 ladies with the lowest gross scores will play a scratch matchplay knockout against each other, whilst the ladies in places 9th to 16th will battle it out together in a handicap knockout. 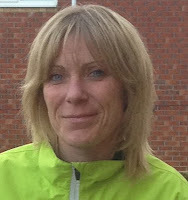 Big congratulations to Brenda Harrington who had the lowest gross score (87) of the day. Brenda will meet Kathy Dale in the first round of the Scratch Knockout. The complete order of play will be published shortly. Today saw the Ladies play their penultimate Thursday in their 2013 calendar of qualifying competitions. It was a beautiful Autumn day with clear blue skies and sunshine. Nineteen eligible ladies were playing for the Cup Winners' Cup whilst the rest of the field battled it out for the Consolation Cup. Congratulations to Virginia Chan who played well and came in with a nett 71. This was enough to see Virginia win the Cup Winners' Cup for the second year running and retain this prestigious trophy. Well done to Kathy Morris who had her best round of the season. 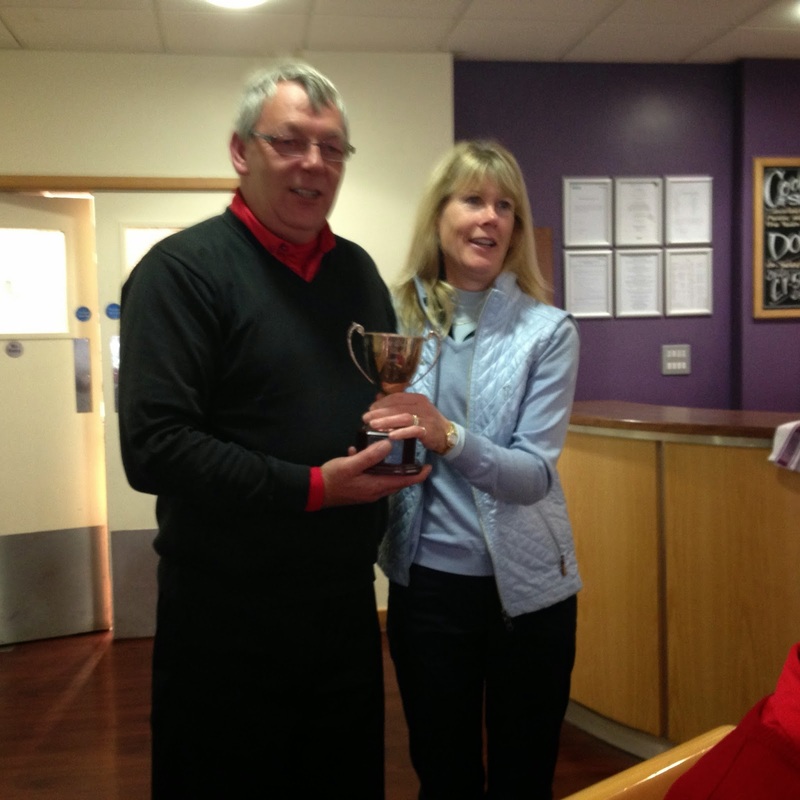 Kathy came in with a magnificent nett score of 67 to make her the clear winner of the Consolation Cup. Both ladies will see their names go onto the Honours Boards. Congratulations to both Virginia and Kathy! Kathy Dale and I had the pleasure of taking part in this year's Claret Jug at The Hertfordshire, together will Andy Ward and Phil Chester. Kathy was standing in for Megan who is currently sunning herself in Portugal. The Claret Jug is an annual event where Crown invite all of the Men's and Ladies' Captains and Vices to take part in a fun day of golf, followed by a 3-course dinner and prize presentation. This is Crown's 'thank you' to its Captains and Vices for their hard work over the year. It is a fabulous day and a great memory for us all. Kathy and Andy played together from the 10th tee whilst Phil and I played from the 1st. Our team score was calculated by taking the best 2 scores from the 4 of us on each hole. Andy had an incredible round that included 3 birdies, one of which was on the 17th! (A long par 5 over water.) He finished with a gross 73 just 3 over par and 5 under his handicap! The rest of us played well too but not nearly so consistently, meaning that we ended up with an overall score of 85, putting us in 4th place and just 1 point behind the team in 3rd. We all had lovely day and great fun and we were delighted to hear Andy's many stories of his epic round and I suppose he was right - if the 3 of us had been a little bit more successful and got just 1 more point each we would have been well up in the prizes. We took this all in good spirit until it was revealed that Andy himself had missed an easy short putt, which probably cost us 3rd place! Congratulations to Kathy Dale who is this year's winner of the Stableford Final. Kathy battled against high winds and bad weather to take this year's title and her name will be 'up in lights' on the Honours Board very soon. Congratulation to Megan and the Vice Captain's team who were the 2013 winners of the Hattersley Cup. It was a very close run competition with the Vice Captain's team beating the Captain's team by just 6 points to 5. There were 42 players taking part, making ten pairs matches and one singles match. The day started in sunshine but the later pairs were left to battle out their matches in the rain. As usual on big competition days, the cup was presented as the Ladies enjoyed afternoon tea, with a delicious selection cakes provided by Joel and his team. Pauline Humphrey and Margaret Gentle competed in the Ping women’s FourBall BetterBall national competition final on Tuesday 17th September at Gainsborough, Lincolnshire. The conditions were challenging as they battled the elements of wind and rain on the championship Karsten Lakes course. Despite this, it was a well orgainsed and most enjoyable day. The field was as strong as the conditions so they were unable to return with the trophy but enjoyed a fantastic experience and received many goodies from Ping for securing their place in the Grand Final. Congratulations to the four ladies who won their respective divisions in this year's Summer Eclectic. This fun competition has been played over five consecutive rounds through August and September. The winners are as follows: Div 1, Sarah Faircliff (76); Div 2, Brigid Kerr (83); Div 3, Marion Dix (89 on countback from Shirley White); Div 4 Mary Hooper (103). Well done ladies! Your trophies will be presented to you at the Autumn Meeting on Thursday 26th September. Congratulations to Brigid Kerr who is this year's GROSS winner of the Eclectic Cup. The Eclectic Cup, apart from the Club Championship is the only competition that is played over two consecutive weeks. This means that a player must hold their form over two rounds. A tricky thing to do in golf, as we all know! Congratulations too to Annette Axelsson who is the NETT winner of the Cup. Brigid will be presented with her trophy at the Autumn Meeting on Thursday 26th September. Today's match at home v Mt Pleasant finished with a draw and some 'nail-bitingly' close matches. Brigid's partner was injured and unable to play at the last minute. A replacement couldn't be found in time and Brigid was left to play her pairs match alone but in true Chesfield style she played her socks off and gave her opponents a 'run for their money'. Today was Jenny Feaver's first friendly match and she turned out to be an absolute star! Mt Pleasant enjoyed the golf and an excellent lunch afterwards in the gallery. A fun day was had by all! This was our last friendly match of the season and we finish the year with 3 draws & 5 losses. On the whole the matches were very close & we just happened to be unlucky. (Someone has to come second!) Better luck in 2014. Many, many thanks to Megan for organising the friendlies this year and to all the ladies who have played. Well done! The par-3 singles matchplay competition between the Ladies and the Junior girls took place this morning in glorious sunshine on the Lannocks Links course. Charlotte Jackson, Courtney Manning, Charlotte Cook, Sydney Young and Danielle Sey played extremely well and put myself, Megan, Kathy Morris, Kathy Dale and Yvonne under a lot of pressure. Tension took its toll, with a couple of the ladies hitting their first tee shot of the day into the rough on the right! The girls, who were the winners of this competition last year, had us worried with their elegant and powerful swings. Fortunately for us, the ladies put up their best performance and won 4:1 overall. It was a very enjoyable day that enabled the girls to meet the ladies, so that when they make the transition from the Junior Section to the Ladies' Section it will not be a daunting prospect for them. We finished the day off with sandwiches and chips and lots of chat. It was great to hear about their Street Dance lessons and learn what music they like to listen to. It was great fun and made us feel a bit younger for a day! 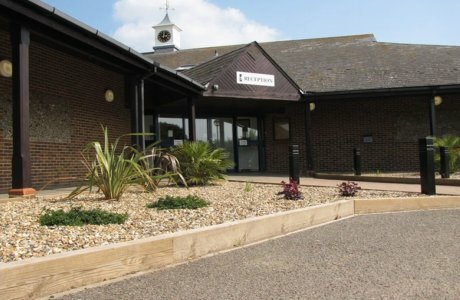 Rogie and Kathy have provisionally booked a number of rooms at Ufford Park, Woodbridge, Suffolk. This 90 bedroomed hotel set in 120 acres of beautiful Suffolk countryside. As well as an 18 hole golf courses, it has a spa, a gym, a 15 metre pool, a 2-tier driving range, large putting green, a pitching area and an American Golf superstore. The cost of the package is £205 for a shared room, to include up to 3 rounds of golf and private dining from Sunday 1st June until Tuesday 3rd June 2014. There will also be the option to participate in fun golf challenges and a short game clinic. Rogie and Kathy have put a sign-up sheet on our noticeboard, so just add your name to the sheet to secure yourself a place. A £25 deposit will be required to confirm your booking. This offer is open to ALL in the Ladies Section, so please sign up and join in the fun!!! A mini Solheim Cup took place today between Chesfield Downs and Mill Green. Chesfield represented America and Mill Green Europe. The day started with coffee and a rousing showing of a YouTube clip of the 2011 Solheim Cup in Ireland. This set a boisterous atmosphere for the day and put us all in a winning mood. The event comprised 3 singles matches, 3 pairs matches and 3 foursome matches, with 1 point awarded for a win and 1/2 a point for a draw. Several of the matches went to a nail-biting finish on the 18th but finally the Europeans clinched a solid 6:1 victory. The day was finished off with sandwiches, chips, pancakes and maple syrup and lashings of banter between the two teams. 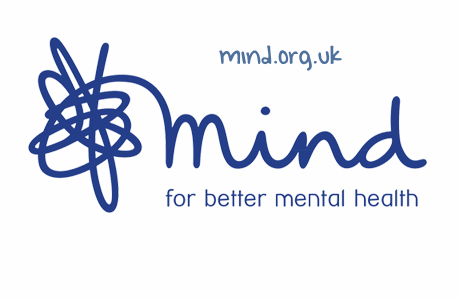 This is a new event that has been introduced by Linda Clark, the Ladies Captain at Mill Green. It has been well supported by Crown, who hope that it will become a permanent fixture in the Crown Calendar, with their clubs challenging each other to hold similar events to help promote professional ladies golf. Congratulations to Mill Green for introducing such an enjoyable event and winning the 2013 mini Solheim Cup. In 2015 the event will be held at Chesfield Downs, where we hope to turn the tables! Congratulations to Katy Cook who was the winner today of the Price Vase, with a fabulous 41 points. Congratulations too to Annette Axelsson who was runner up with 38 points. The Price Vase will be presented to Katy at the Autumn Meeting on Thursday 26th September. Megan and Lorraine celebrate the Ladies win over the Senior Men in the 2013 Palmer Cup. Normally held in May, the Palmer Cup is one of the most popular events in the Ladies calendar. Five pairs of Ladies and Seniors battled against each other in matchplay, resulting in a convincing 4:1 victory for the Ladies. This means that the Ladies have now reclaimed the cup from the Senior Men, who were last year's winners. It was a gloriously sunny at Bourn GC today - a complete change from 4 years ago when it did nothing but rain. We had a fun day of golf followed by a lovely meal. The Kelland Pairs Trophy was won by Diane Chapman and Jackie Reid, with a stunning 41 points. Mary Hooper and Katy Cook were runners up on count back, with 35 points. Definitely a course to play again! Thank you Megan for organising such a lovely day out for all of us. Check out the slideshow for more photos. The Crown Ladies Challenge was held at Stapleford Abbotts GC today. Myself, Kathy Dale and Chris Leary represented Chesfield Downs. This is the second year of this prestigious event, which is hoped will become one of the big events in the Crown Group's calendar. The competition was conceived and organised by Maggs Kyte of Merrist Wood last year. The Stableford Abbotts GC were the 2012 winners and have hosted this year, as the organisation of the competition passes to the winning Club. This competition is held in conjunction with an Open event which is open to clubs outside of the Crown group. Kathy, Chris and I played pretty well together and came in with 70 points (best 2 scores counted on each hole). We came 5th on countback in the Open event and second in the Crown Ladies Challenge, which was won by Merrist Wood, with an impressive 79 points! This means the 2014 competition will be back at Merrist Wood. We tried very hard to win, as we thought Megan would love to organise this competition during her captaincy but, sadly, it was not to be. 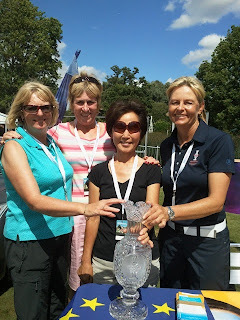 Diane, Pauline & Angela went to the ISPA Handa Ladies Masters yesterday at the Buckinghamshire Golf Club and had their photo taken with Liselotte Neumann, the new Solheim Cup Captain and with the Cup (which Europe holds at the moment). Liselotte was there to raise awareness of the competition which starts on 13th August in Colorado. The Chesfield girls didn't get an invite to go to Colorado to support the European team, although, Liselotte tapped Pauline for hints and tips regarding preparation, selection and team tactics! Now, that is a claim to fame!!! The Chesfield ladies will be playing their own Solheim Cup against Mill Green on 16th August. Chesfield will be representing the Americans so, on that day, you will have to cheer for America. Congratulations to our winners today! The weather was fabulous and Stableford points were high for a lot of players. Angela Chatterton came in with an amazing 41 points to secure the Ann Warner Trophy. Runner up Marica Kelland was hot on her heels with 38 points. The Ann Warner Trophy is for competitors with handicaps of 29 or under. Marion Dix was the winner of the Maureen Eastwood Salver with a great score of 36 points, just squeezing Christine Skeen into second place with 35 points. 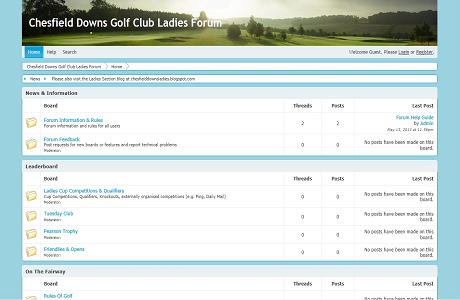 The Maureen Eastwood Salver is for competitors with handicaps of 30 or over. What a fabulous day for golf! Some amazing scores were recorded today in the final round of the Ladies' Club Championship. Pauline Harrison held her nerve and turned in another great score of 82 gross. Combined with Pauline's first round score of 83, this was easily good enough to secure the title of Ladies' Club Champion 2013, with a very tidy gross score of 165! 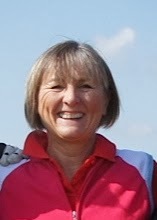 Jackie Reid also had a stunning 2nd round, scoring a gross of 83 and a nett of 62. 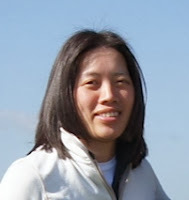 Together with a 1st round nett of 69, Jackie's combined score put her ahead of the rest of the field in the nett competition, meaning that she is the winner of the Angela Chatterton Cup, 2013. Congratulations to both of our winners and to all of the ladies who took part over the two rounds. We had lovely weather on both days and some great scores. The presentation was made to the winners by Tim Hudson, General Manager, and took place after a delicious cream tea! What better way to celebrate such a prestigious competition!